Evaporative coolers are commonly used to provide cooling for homes and businesses in dry climates. 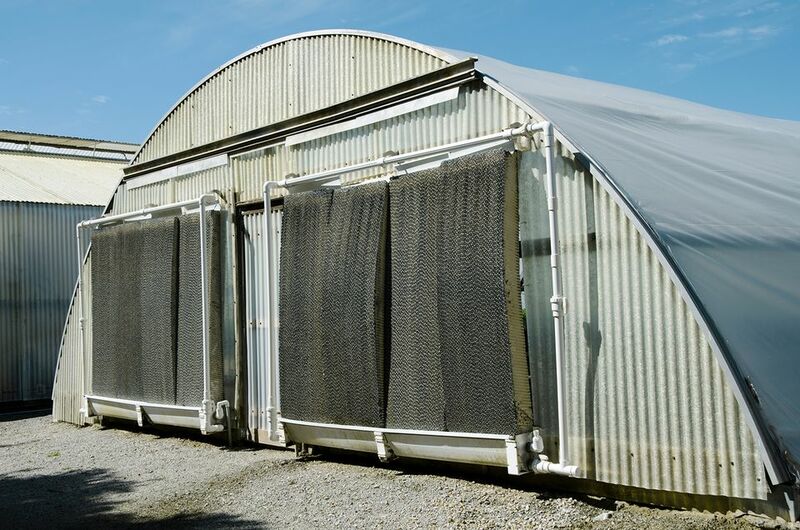 Evaporative coolers (also known as swamp coolers) provide cooling through the simple physics by which evaporating water absorbs heat from the surrounding environment. An evaporative cooler cools the air much like sweat evaporating from your skin cools off your body. Start by removing the cover or tarp from around the unit. This is a good time to inspect the condition of the cover before storing it for use next winter. If the cover is torn or has holes, order a replacement cover now so you'll have it ready when it's time to winterize the unit again. Remove all of the sides of the cooler unit by releasing the panel catches or clips and sliding the panels up slightly and then out. Set the side panels aside, facing down. Tip: To save some time later, keep track of which panel belongs to each side of the unit. The panels are sometimes slightly different, and they may not fit exactly right unless they are put back in the same positions. Change the pads, as needed. Your evaporative cooler has absorbent pads that hold water as a fan blows air across them to evaporate the water. Depending on the design of your cooler, these pads may be flat panels or they may be attached to a rotating drum. Over time, these pads become stiffened with mineral deposits, which hinders their ability to hold water. If the pads were not changed in winter as part of the winterizing process, you should change them now. When to change the pads is really a matter of preference—they just need to be changed once every year. The size of the pads varies for each cooler, so you may want to measure them before heading to the store to buy replacements. Connect the water line to the cooler fitting, and carefully tighten the nut with a wrench or pliers. Confirm that the drain plug is in place in the water pan, then turn on the water supply to the cooler. Inspect the cooler pan and the water line for any leaks. Some leaks are quite obvious, such as when a pipe is broken or punctured, but others are slower and harder to see. Look around the drain plug for any leaks, and tighten the plug, if necessary. This is also a good time to check to make sure that the float valve is working properly. Wait for it to turn off the flow of water when the cooler pan gets full. Make adjustments, if necessary, to prevent overfilling the pan. Replace the float valve if it does not seem to be working properly. 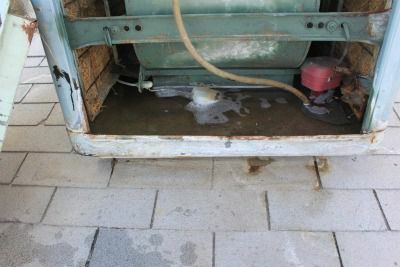 When the pump is working properly, the water should be flowing freely from the "spider" water-feed tubing onto the sides of the evaporative cooler. If the water flow is sluggish, it could be a sign that the pump is not pumping or that the spider or the lines are clogged. Confirm that the motor is running and the fan wheel is turning. Reinstall all of the side panels in their corresponding openings and secure them with the catches or clips. Your evaporative cooler is now ready for summer!